So do we have any members here that know a bit about gardening, plants and possibly landscaping? I'm hoping for some shrub, tree, and perennial flower suggestions for zone 8. What trees, shrubs and flowers do you folks have in your yards? So far I've planted 3 crepe myrtles, 2 azaleas, and a japanese maple in our backyard. We have some some shrubs in the front yard that I haven't identified yet along with a maple tree in the front yard as well. - some shrubs that will be in partial to full sun...not sure what kind yet...suggestions? - some other plants/flowers for a full sun location preferably perennials with flowers that will attract butterflies and hummingbirds, lantana is definitely going in and also hibiscus...other suggestions? I've got verbena down as a possibility but need some more info on them. Oh and tree suggestions would be good too, something fast growing that also provides shade. One person suggested Dogwood and/or Redbud. Any other suggestions? I'd like to get a willow and something else...maybe a dogwood or another maple? I don't know, ideas? Sorry. I know nothing about gardening. I know a little about herbs, though! My thing is in the kitchen...ask me about food and cooking, and I'll be able to help! Oh Kate that would be awesome, thank you! I have pics of the areas that I can post too if that would help. Claudia, I am doing a vegetable garden as well. That I already have picked out since I do have experience growing veggies. This year I'm planning to plant italian parsley, cilantro, chives, and cherry tomatoes...maybe romaine lettuce but I don't have experience growing lettuce so that one is more up in the air. I got a suggestion from someone that rosemary would make a nice shrub that would also offer something to cook with as well. I'm not really leaning toward rosemary so much but if more people were to recommend it I might think some more about it. Here's what I posted on a gardening forum yesterday, I've received only 2 responses that weren't as helpful as I would have liked. 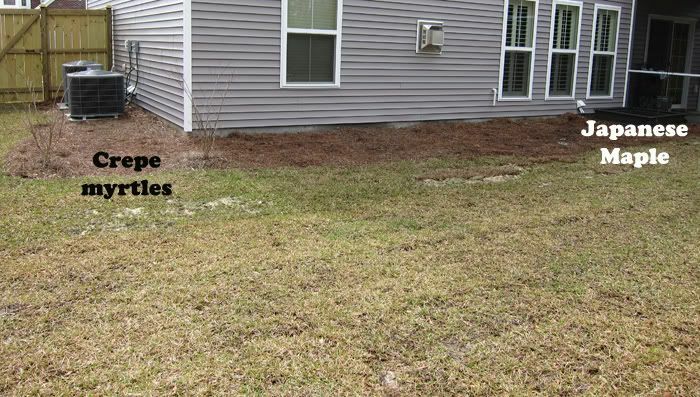 Hi all, we are pretty much starting with a clean slate and are looking for some input and ideas for landscaping our yard, both front and back. We are in zone 8, (Charleston, SC area) with sandy soil. 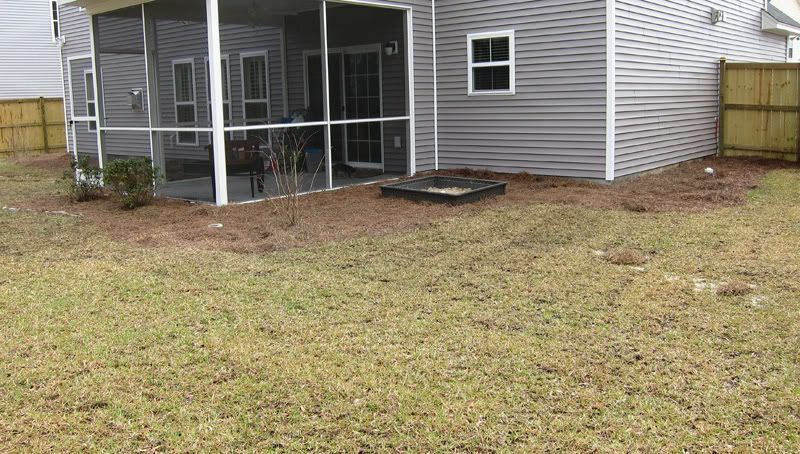 Currently we have pine straw in all the beds however we will be changing that out to mulch, again in both the front and back yard. 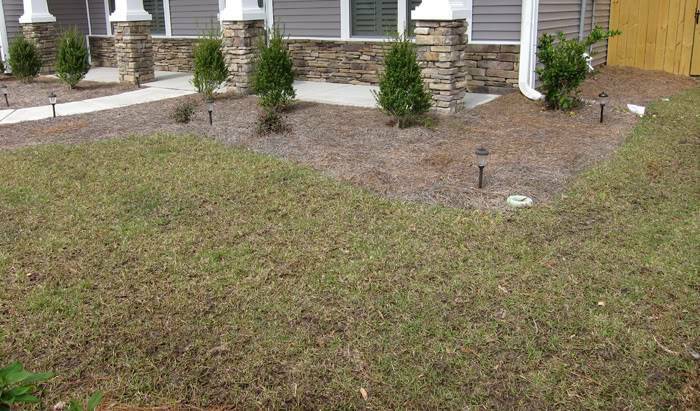 Mulch suggestions? Is one better than another? So far I intend to use cedar mulch as we have dogs and the cedar will repel fleas. I guess I'll start out with the front. We have a maple in the front and we'd like to keep that as the only tree out in the front yard. However we would appreciate some ideas for (preferably perennial) flowers to plant in the front of the house and also around the base of the maple tree. The front yard faces southwest and gets a lot of sun from late morning to evening, most of the day pretty much. Now on to the back yard. Along the back of the house I would like to put some small shade loving plants, the area along there only gets morning sun and spends most of the day in the shade. Finally, we have a long stretch at the back property line that is completely empty and needs some livening up. This section gets full sun all day long and would need full sun loving plants. I'd like to have some color there and also have something that would attract butterflies and hummingbirds. 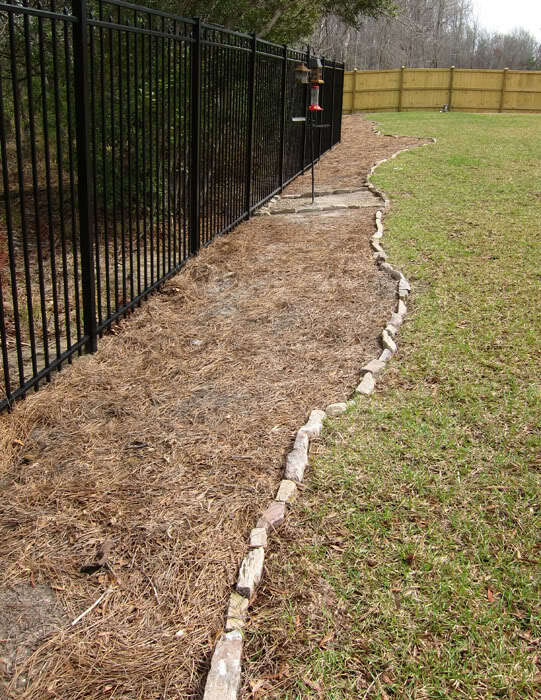 I would also like to put in some rose bushes in that area among other plants that you folks might suggest. We would also like to put in a few trees (at least 2) in the backyard. Something fast growing, hardy, that will also provide shade. Any and all suggestions would be extremely appreciated! Our redbuds are messy. They drop a dried bean-like pod in the fall. But I love the look of the redbud. Perhaps someone has developed a hybrid that has less seed-pods. Most willows need lots of water. It would do well in a "swampy" area of the yard. I have heard that the roots of a willow will grow toward your water and sewer lines even to the point of causing damage. I'm in VA, so not in the same zone, but I would recommend Cheddar Pinks, Moonbeam Coreopsis and Stella D'0ro Daylily as some of my favorite sun-loving perennials. I don't think any of these attract butterflies. What about Phlox? I think some tall Phlox may attract butterflies. Good luck with your gardening! Mine is currently being UN-planted. Last week Sabaka pulled up a root and was carrying around the yard. Who knows what it was! I guess it'll be a few more years before I can work on my gardens again. Thanks for the suggestions Lisa! Are the Redbuds messier than crepe myrtles? I know crepe myrtles drop their seed pods as well and I'm quite used to crepe myrtles and even the palm trees my dad had when I was growing up dropped seeds everywhere. I wouldn't mind the seed pods if the tree was worth it. I've looked online at pics of redbuds and haven't seen a single one with green leaves, do they have or get green leaves? Do you have a pic of yours? Hmm, I had forgotten about the water thing with willows. We do get plenty of rain and have an irrigation system in the yard...do you think the willow might be an issue with the irrigation system? I know of the perfect spot in the yard that always takes longer to drain than any other part of the yard...maybe that would be a good spot for a willow. And I'm definitely not set on getting a willow either, I just have always loved the way they look but never had one before. I am certainly willing to forgo the willow for something better. I will have to look into your other suggestions some more. I would love to put in some daylilies but will admit I don't have experience with them. My mom is amazing with lilies of all sorts but she's in FL. And I want color more than butterflies/hummingbirds so colorful perennials in general are high up on my "want" list. I know that the lantana that I will be putting in will attract butterflies and hummingbirds so at least I have that. 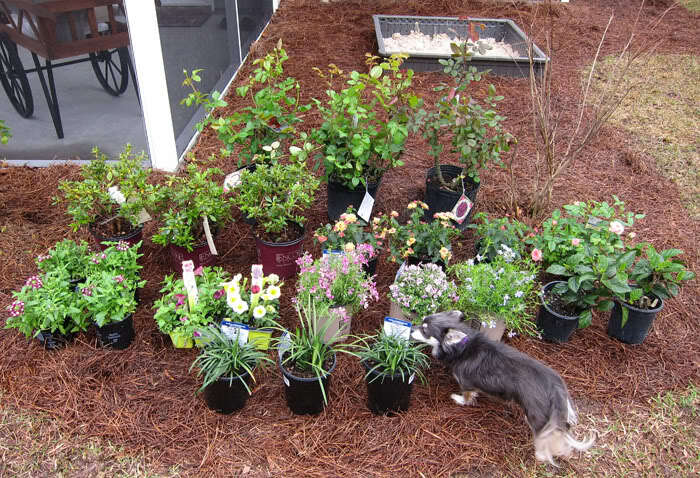 Oh and I also plan on getting more azaleas too, love those plants! How about a butterfly bush? They look a little like a lilac, but the butterflies go crazy! That and the lantana would be great for attracting the butterflies. I also have some pink Evening Primrose that propagates by spreading roots underground. 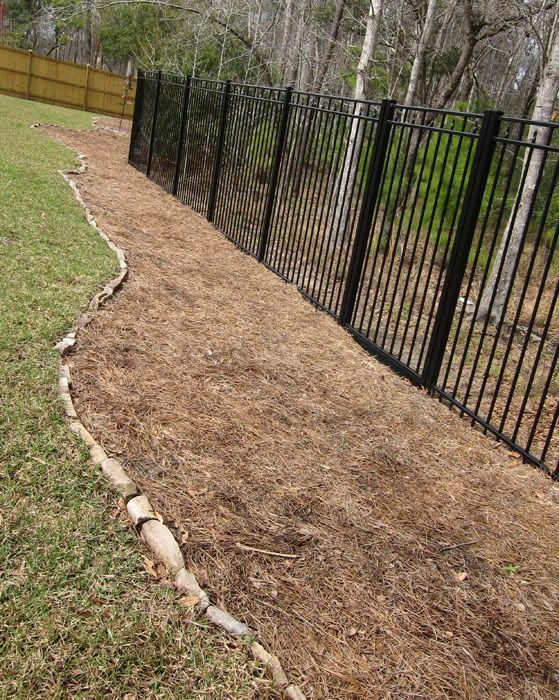 It could work as a ground cover in the sunny areas. I don't have a pic of my redbuds not in bloom, but they do get a little, cute heart-shaped green leaf in the summer. Google "redbud leaf". I love the willows, too. I get so excited when I pass one on my way out of the neighborhood and it is starting to bud. That means spring is coming! Are you familiar with www.springhillnursery.com? 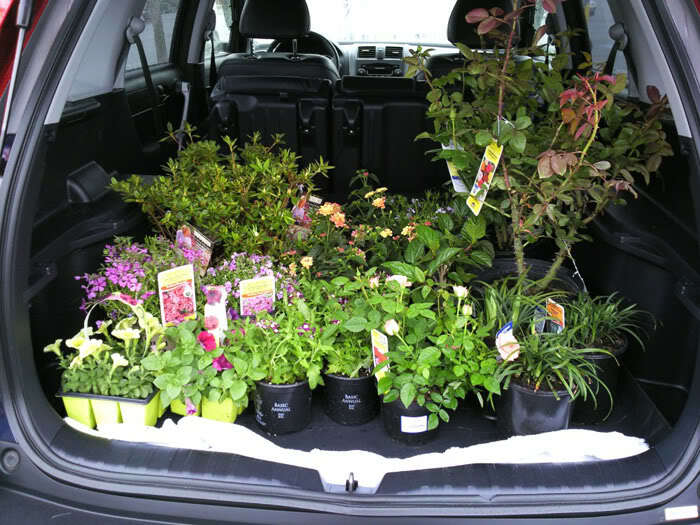 They have great garden suggestions and nice deals for ordering their suggested pre-planned gardens. Also, the redbuds are not messy in the same way as a crepe myrtle or a palm. I haven't had a palm, but I think I have seen rottening "fruit" around them in the south and the crepe myrtle will stain cars or patios if its droppings fall on them. The redbud's mess is more like acorns from an oak tree. You will just have to rake the pods up like you would dried leaves. I've never heard of a butterfly bush, I'll have to look that one up. You have a lovely redbud too. 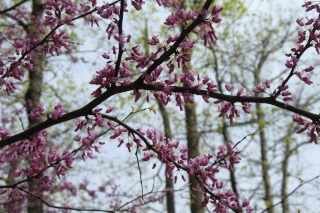 I was looking this afternoon at a dwarf non-seeding redbud available online, looks just like normal redbuds but only grows to 8-10 ft. Maybe that would be a nice alternative? Oh and we get acorns galore, the woods behind our property are loaded with oaks! Thanks for the site suggestion. Have you ordered from Spring Hill Nurseries before? If so, how was your experience and what was the size and quality of the plants you received? I don't see on the website anywhere that it says what size the product that is shipped to you is. Am I missing it somewhere? I've heard some recommendations for http://www.bluestoneperennials.com/. They also have perennial packs but my concern is the small size of their plants. 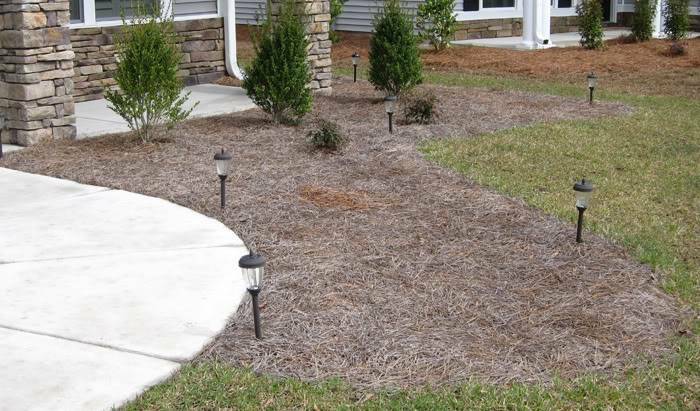 Do you have any experience with or have you heard anything about Bluestone Perennials? By the way, thanks for all the helpful suggestions Lisa! I love to garden but our climents are so different. I know back in PA the dogwoods got sick. Love butterfly bushes. The non-seeding redbud seems like a nice choice! Ours are native ones growing on the edges of our wooded property. I have not heard of Blue Stone Perennials. Spring Hill sells many of their plants as roots. You will get a little pouch full saw dust and a dead-looking root. The roots are a good size and grow quickly and into a very hardy plant. I ordered a drawf lilac that was very puny when it came but grew into a beautiful bush after a of couple seasons. If you use Spring Hill for nothing else, you can look at their pre-planned gardens and buy what they suggest from a local greenhouse. Jenn, why did the dogwoods not do well in PA out of curiosity? I see a number of locals have dogwoods in their yards so I am sure they do well here. 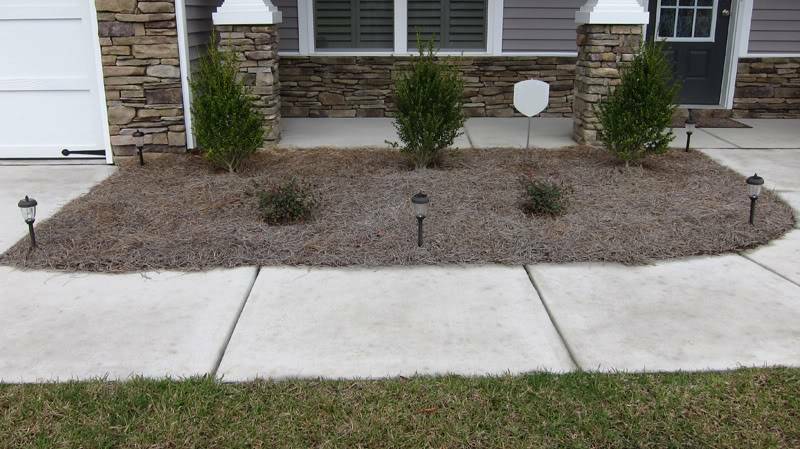 I am seriously leaning toward a dogwood and possibly a redbud but will look into my options and availability. Lisa, I am definitely looking at the perennial packs that the online stores offer for ideas. Maybe for harder to find items that I like I might order online but will try to buy as much as I can locally. If it weren't for the fact that the closest good nursery (that is still open) is 45 minutes away (one way) I would be talking to them rather than spending so much time asking questions and doing research online. 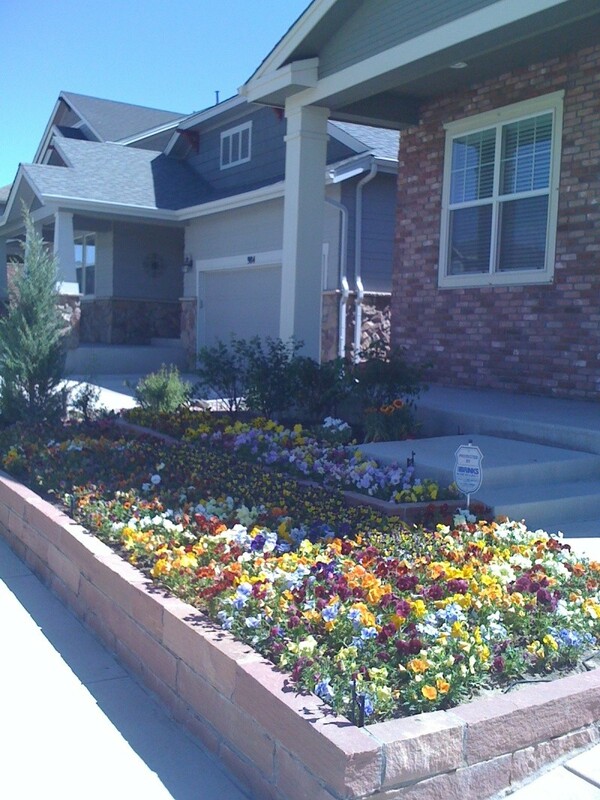 Here's the front of my house last spring/summer full of pansies. Of course we had someone come and built the retaining wall and when I asked for flowers that will come back year after year that can handle our winter, we got pansies! A boat load of them! The 4 shrubs you see toward the back row are burning bushes. They're green during the summer and then Fall comes around, all the leaves turn dark red. Wow, Claudia, that is gorgeous! I want to put pansies in but they are cool weather plants (perfect for CO) so they will not bloom during our warm SC summers. They do bloom quite nicely all fall, winter, and spring here though. I think I might still put a row or two of pansies in my flower cart, maybe a row of pansies and a row of petunias with a branching, ivy like plant draping the sides of my flower cart. Never heard of burning bushes, I'll have to look them up later. Gosh that is so gorgeous, Claudia! I could stare that those flowers forever! I promise I will post pics of the progress I make with my gardening this year. Maybe do some before, during and after shots. we definitely had tons of compliments! yes, pansies are cool weather flowers, however, our summers are hot, and they lasted through July (or was it August) until it got pelted with hail. i am starting to see a few of them sprout up again, so we'll see. i also LOVE lillies and how they look in a flower garden...and i believe they are perennials, but if i'm not mistaken, i think you have to do something and dig up the bulb and preserve it something or other and replant in early spring....too much work for me! LOL! i'm more 'put the seed in the ground, cover with nutrient filled dirt that you buy from home depot, and water'. and then i hope and pray it grows with little maintenance....LOL! I had burning bushes at my last house as well, but I believe the colder the temperatures the redder their foliage becomes. You should check that out to see if that is true. I think they have a few "ugly" weeks when they are changing from green to red and then again when going back to green from red. If the SC climate never gets cold enough for them to turn brilliant red, they may stay the "ugly" brownish in-between color all winter. They are pretty, though, and perhaps a very good option. I would do nothing but perennials in your yard and leave annuls for flower pots. 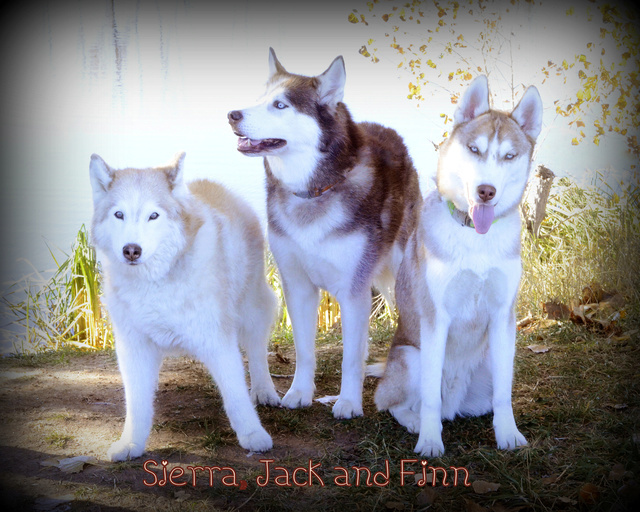 it takes 2yrs for them to really take off but it is so worth it. Daises are also a good one for me. I do remember that pic, Jenn and thanks for the heads up on your garden pics on FB! I went over there and looked and you have some gorgeous flowers! Thanks for the links, Kate! I do love having a clean slate to start off with (we bought a new construction house in September) but it won't be bare for long! I'm sure in 2-3 years I'll be wishing for more room too! It's so weird, I've honestly received more advice here than on gardening forums. 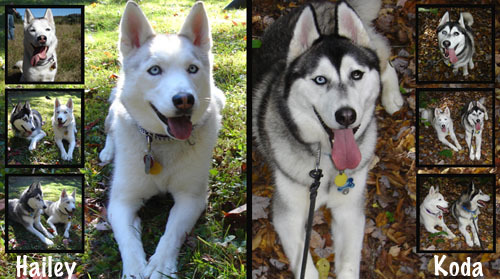 That must just be because husky people are AWESOME!!! Thanks for all the help guys! So after a whole week of research I came up with an incomplete plan for my garden. I drew up my tentative plans and showed my hubby what I want to do. He approves, so if it is not raining tomorrow I will try to head out to the nursery to see what they have in stock. Hopefully they will have what I want, but I have a few back ups written down just in case they don't. I am not picking up everything that I want to put in just yet. I want to tackle this project in phases, so hopefully (fingers crossed it's not raining tomorrow) I can pick up some of the plants tomorrow and get phase one of my gardening underway. I will be focusing more on the flowers and shrubs to start and then later will focus on trees and filling in with even more shrubs. Watch out, I'm a woman on a mission and when I get my mind set to something it's going to happen! Please please please no rain tomorrow! Wow... you all are way more talented and interesting than I am. For those of you who have seen my pictures on FB of our house, I have absolutely no sense of decoration INSIDE let alone outside. Who wants to come decorate my house? LOL. I think you are smart to plant in phases. 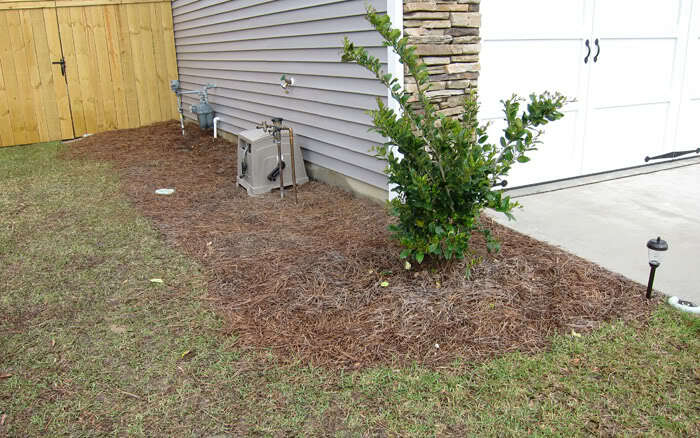 If you find a plant not thriving where you planted it, you could then easily move it to a different location and perhaps have better results. I can't wait to hear what you bring home tomorrow! Well I called and compared prices at the closest "decent" nursery versus Lowes and their pricing was pretty much identical. So I figured I would stop by Lowes and see how good their plants looked and if I didn't think they were worth it, I'd go to the nursery. I gotta say that Lowes knocked my socks off. lol They had EVERYTHING I was looking for and all the plants looked excellent. They actually received a HUGE shipment yesterday and were still putting everything out which was good for me because I got first pick, but bad because it was hard to find what I wanted as they were still being brought out. But in the end I spent a good 2 hours at the Lowes garden center and came away with everything I wanted and more. So it looks like phase one is off to a good start. Come hell or high water I was going to get my plants so I ended up doing my shopping and loading/unloading in the rain. Snapped this quick pic with my cell upon getting everything loaded into my car. Now this is a "green" vehicle. Got everything unloaded and put in the backyard at home...in the rain. I tried to arrange everything nicely to snap a better pic of my loot. I am one VERY HAPPY camper despite the nasty weather. Now comes the dirty work. also on Lowes LOVE the garden center. just so you know they always have 50% off racks during the summer. even if the plant looks half dead if it is a PERENNIAL pick it up, once in the ground with some love they will come back also check the labels they don't always carry what will work in your zone, i have found that out in CO, some of my first yr plants never made it to the next summer as our winters are harsh. i have many of a yard projects for this summer in between hiking! Thanks for the heads up, Jenn! We do plan on getting the trees before summer, it just might be in April or so that we get the trees. It really depends on my husband and when he feels like coming out to the nursery with me to pick them out. I know last fall in October the local True Value had a ton of trees and shrubs on clearance and that's when we got a great deal on our Japanese maple, azaleas, and crepe myrtles. 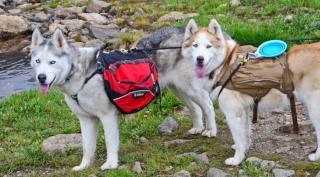 If we don't find something we really like for the right price in the next month or so we will probably wait until the fall and see what goes on clearance. We got amazing deals last October as the stores were clearing their stock. I have been checking out the clearance section each time I go, but all they had today were pansies which will stop blooming very soon as summer approaches so I decided against them. I will keep checking though when I am there.